Why the real available memory is smaller than the memory in the specification? and OS updates require pre-reserved memory as well, in order to continue to provide added value for GALAXY S4 owners throughout the device’s whole lifespan. In addition, a portion of the memory is allocated to running the operating system on an optimal level. 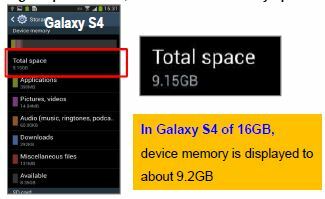 Samsung respect customers’ desire to use more memory space for their own selected applications and content. At the same time, Samsung will continue to make our best effort to optimize the software features in order to secure more memory space for users.